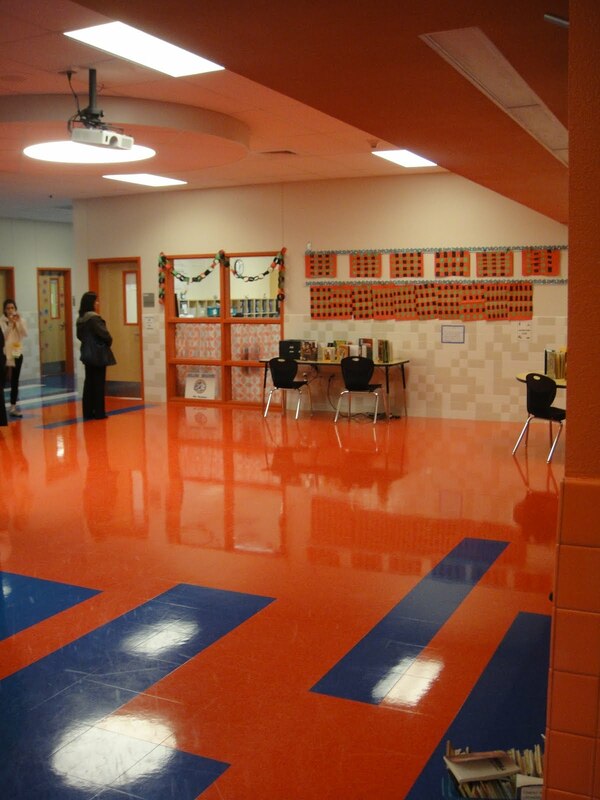 Red was the colour surrounding me as I toured a new elementary school in America recently. Not just any red but really scarlet - the photographs are deceiving in appearing rather orange. The colour identified a learning hub, a group of classrooms round a central flexible learning area. Entering into the hub, past the well designed 'open' bathrooms, the walls, ceiling and further in the floor were all dominated by this vibrant, bold colour. I have to say that many of the visiting professionals I was with didn't like it - they thought it was just too much and unlike the other areas of different hubs. However, I do have to agree with my friend, massively respected education architect and planner; Randall Fielding of FNI in his article 'Learning, Lighting and Colour - Lighting Design for - Schools and Universities in the 21st Century' when he comments on the use of primary colours for young students. "Often the the strategy is expressed that brightly lit, primary colours are the best environments for young children. This is not born out by any reputable research. In fact, experience has sown that children are wonderfully sensitive and responsive to nuances in both lighting and colour. For example, children are particularly attuned to the colours of nature and human skin tones, and yet these are completely out of the primary range. Primary colours can be harsh..."
I am not against the colour red being used but, to quote Randy again, "All colours have a place for learners of all ages, when used thoughtfully". I have to admit though, when seeing the great slab of red as we entered the learning hub, to not being convinced about the way it is used here, but.... what do you think? Whilst in the States I've been catching up with the latest thoughts of Michael Gove regarding ICT by watching his speech to the The Schools Network. There seems to have been a bit of a rethink of his thoughts, with some really quite positive views about the value of technology in education - he could have said more, but anything positive is good. Once he started about ICT he acknowledged "how little classrooms have changed and given how much technology has transformed work places, the DfEe has been behind the curve in appreciating what needed to be done". Agreed! He confirmed that there were no tensions between the use of technology and the expectation of high standards –he went on to note the need to reflect on how technology can enhance access to the UK's rich inheritance of literature, scientific thinking and mathematical skills. He also seemed surprised by just how much high quality content was accessible by everyone. Many people have been saying this for years. His confirmation of the previous focus on hardware, especially on machines that have rapidly become obsolete would be agreed by many, and at last he has acknowledged that the focus should have been in training so that staff were as adept and ICT literate as they can be. He advocated an increasingly need to refocus investment and thinking in human capital. He noted that many students have access to all the technology, iphones, tablets, computers etc. We all know this, but wouldn't it have been even better if he had acknowledged the role that students could bring to enhancing well planned lessons, especially in modelling how the technology they use could help them all. Mosts teachers will never be better in using the technology than their students - why not use these skills! In America last week I spoke about how I expected more and more schools to get 3D printers - 'because they could'. Mr Gove bizarrely also spoke about them last week, saying how they give new levels of sophistication and innovation to design. But, to use them effectively, and give real relevant purpose to their use, there also needs to be curriculum revision and training for staff and students. The capabilities are so great - the students will get it, but they will have to be allowed to really explore the real sophistication and uniqueness that can be achieved rather than be forced to undertake a simple potentially 'dumbed down' project which could almost be done in other ways. Although Mr Gove did not go far enough, what is really positive though is that the Government are beginning to 'go public' about the role ICT should play in education to support high standards and encourage innovation.